In keeping with these principles, Hoover’s response to the crash focused on two very common American traditions: He asked individuals to tighten their belts and work harder, and he asked the business community to voluntarily help sustain the economy by retaining workers and continuing production. He immediately summoned a conference of leading industrialists to meet in Washington, DC, urging them to maintain their current wages while America rode out this brief economic panic. The crash, he assured business leaders, was not part of a greater downturn; they had nothing to worry about. Similar meetings with utility companies and railroad executives elicited promises for billions of dollars in new construction projects, while labor leaders agreed to withhold demands for wage increases and workers continued to labor. Hoover also persuaded Congress to pass a 60 million bill to provide relief to drought victims by allowing them access to food, fertilizer, and animal feed. Hoover stood fast in his refusal to provide food, resisting any element of direct relief. The final bill of 375 million to states to help provide food, clothing, and shelter to the homeless. But Hoover opposed the bill, stating that it ruined the balance of power between states and the federal government, and in February 1932, it was defeated by fourteen votes. As conditions worsened, however, Hoover eventually relaxed his opposition to federal relief and formed the Reconstruction Finance Corporation (RFC) in 1932, in part because it was an election year and Hoover hoped to keep his office. Although not a form of direct relief to the American people in greatest need, the RFC was much larger in scope than any preceding effort, setting aside 61 million loaned, 1.5 billion to states to fund local public works projects. This program failed to deliver the kind of help needed, however, as Hoover severely limited the types of projects it could fund to those that were ultimately self-paying (such as toll bridges and public housing) and those that required skilled workers. While well intended, these programs maintained the status quo, and there was still no direct federal relief to the individuals who so desperately needed it. Hoover’s steadfast resistance to government aid cost him the reelection and has placed him squarely at the forefront of the most unpopular presidents, according to public opinion, in modern American history. 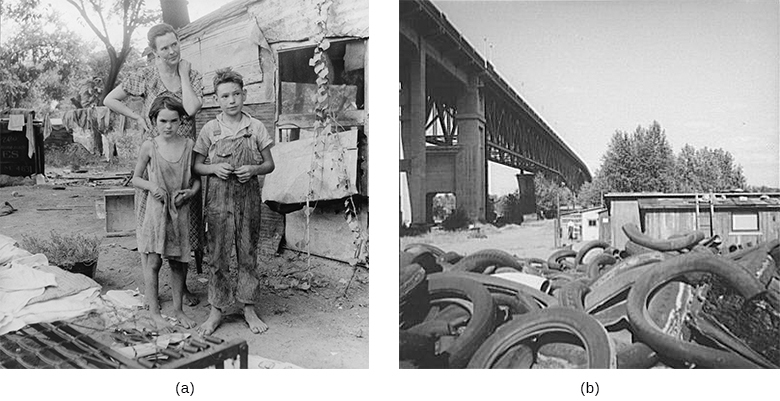 His name became synonymous with the poverty of the era: “Hoovervilles” became the common name for homeless shantytowns ([link]) and “Hoover blankets” for the newspapers that the homeless used to keep warm. A “Hoover flag” was a pants pocket—empty of all money—turned inside out. By the 1932 election, hitchhikers held up signs reading: “If you don’t give me a ride, I’ll vote for Hoover.” Americans did not necessarily believe that Hoover caused the Great Depression. Their anger stemmed instead from what appeared to be a willful refusal to help regular citizens with direct aid that might allow them to recover from the crisis. 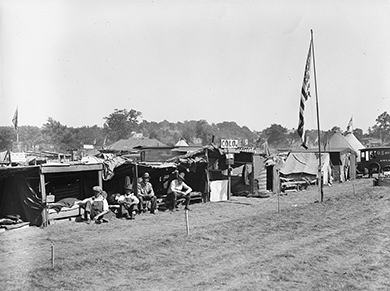 One of the most notable protest movements occurred toward the end of Hoover’s presidency and centered on the Bonus Expeditionary Force, or Bonus Army, in the spring of 1932. In this protest, approximately fifteen thousand World War I veterans marched on Washington to demand early payment of their veteran bonuses, which were not due to be paid until 1945. The group camped out in vacant federal buildings and set up camps in Anacostia Flats near the Capitol building ([link]). Many veterans remained in the city in protest for nearly two months, although the U.S. Senate officially rejected their request in July. By the middle of that month, Hoover wanted them gone. He ordered the police to empty the buildings and clear out the camps, and in the exchange that followed, police fired into the crowd, killing two veterans. 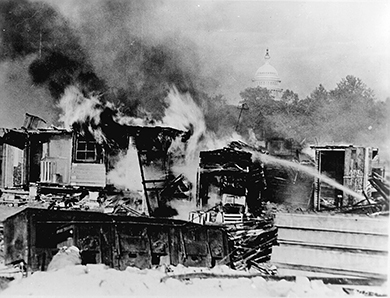 Fearing an armed uprising, Hoover then ordered General Douglas MacArthur, along with his aides, Dwight Eisenhower and George Patton, to forcibly remove the veterans from Anacostia Flats. The ensuing raid proved catastrophic, as the military burned down the shantytown and injured dozens of people, including a twelve-week-old infant who was killed when accidentally struck by a tear gas canister ([link]). Which of the following protests was directly related to federal policies, and thus had the greatest impact in creating a negative public perception of the Hoover presidency? Which of the following groups or bodies did not offer direct relief to needy people? Hoover formed the Reconstruction Finance Corporation (RFC) in 1932. This represented a significant effort, although it did not provide any direct aid to needy Americans. The RFC set aside 1.5 billion to states to fund local public works projects. Hoover’s limitations upon the types of projects that could receive funding and the types of workers who could participate, however, limited the program’s utility. the belief, strongly held by Herbert Hoover and others, that hard work and individual effort, absent government interference, comprised the formula for success in the U.S.
President Hoover’s Response by OpenStaxCollege is licensed under a Creative Commons Attribution 4.0 International License, except where otherwise noted.